Villa Oasis is not your average rental unit but a gracious home. 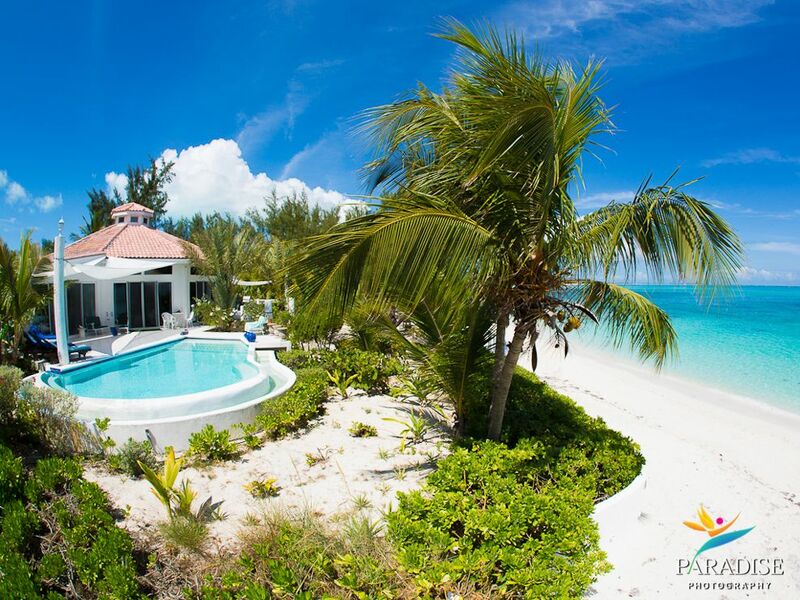 It is a private villa situated directly on Grace Bay, voted as having the #1 beach in the world three years in a row. Right at your doorstep you will find miles of powdery white sand to stroll upon or to watch over. You might choose to spend the afternoon in our infinite edge pool with its crystal blues that magically meet the ocean hues. Catching a nap or reading a book under the magnificent cassuarina trees in one of the hammocks is also a favorite among guests. The villa sits within Princess Alexandra National Park with its underwater nature reserve providing excellent snorkeling. Turtles are often seen immediately in front of the villa, while an easy snorkel will take you to nearby coral heads and the Bight Reef in front of Coral Gardens with its myriad of exotic marine life to observe. Centrally located, Villa Oasis is within strolling distance of several restaurants, from casual beach side to Providenciales' finest. There are also spas and shops withing walking distance, and the main supermarket is only a five minute drive away. The elevated four-bedroom is a luxurious villa that sleeps up to eight guests. The great room with its vaulted ceiling and tall sliding glass doors affords a 180-degree panoramic view of the beach and ocean. Central is the living room with comfortable seating for the entire party, while the entertainment corner, grand piano, gourmet kitchen, casual dining for four, and the formal dining room for 12 radiates out from this central hub. Three of the four bedrooms offer king size beds, with the fourth with two twin beds. Two of the rooms have en-suites - two share. All bedrooms are air-conditioned for your sleeping comfort. The villa is furnished with European oil paintings and art objects. The 110-foot wide outdoor terrace provides stunning views of breathtaking sunrises and sunsets where guests share unforgettable times with loved ones. This home has everything that one would need, from cribs and toys for the youngest members traveling to champagne and crystal for the more discerning. On the beach level of Villa Oasis is our two-bedroom apartment - operating as a separate unit complete with comfortable living area, dining room with seating for six, a fully-equipped kitchen, and two baths. This unit sleeps up to four guests and includes a large covered terrace with lounge chairs and table for dining al fresco, affording guests relaxing shade from the midday sun. The two bedroom is a fully air-conditioned space. Next to the two bedroom is a lock-out studio apartment that is perfect for the nanny or as a third bedroom. The two-bedroom may be rented separately or together with the four-bedroom villa. The two villas together provide the perfect setting for a family get-together or for those who wish the additional space. Our rates include airport meet and greet as well as a daily maid service so that your stay at Villa Oasis is a relaxing experience from the moment you step out of the airport. Our on-island manager is available throughout your stay and is happy to assist you in planning activities and with all necessary bookings and reservations. Be sure to contact Villa Oasis early if your dates are inflexible. You won't be disappointed! When we found the perfect beach on this island, I realized we cannot go home without having a piece of this paradise, At that point in time, there were no hotels or condos on the beach, one could walk for hours without seeing a new dwelling. Villa Oasis is a hexagon beach house that is built directly on the beach. When we found this property - we knew we found the place we wanted to build. Our home has a European flair and is filled with love and tranquility. There is privacy yet, you are in the middle of the beach and all it has to offer. With enough room for 14 people comfortably - all will have their own space or choose to be together in the great room. This house gives each person what they are looking for. Our guests are offered an incredible amount of privacy, yet they are in the middle of the island, being able to walk to restaurants and bars on the beach. Each room has individual AC units. Side by side fridge, ice maker. Infinity pool overlooking the sea directly on terrace of Master bedroom. Villa Oasis is a wonderful place to bring the whole family. We were 5 adults and 4 children and we were never without something to do. The beach was just as in the photo's and the water was amazing. Relaxing was not hard to do and all of the beach and water activities you could want were right there as well. Our hostess was a warm, caring woman wanting to help in any way she could. We now consider her part of our family. Hopefully we will be able to return next year to this wonderful place in paradise. The whole family has voted for a return vacation. Perfect location on grace bay. The best snorkeling on the beach is just in front of the house. The pool is fantastic and restaurants are walking distance. The house staff are awesome. Romeo is superb and so very accommodating. The owner (Katalin) is the best! Took care of every concern and made us feel so welcome. Beautiful view, on sand and water with forever pool. Charming house. Denise, Romeo and Owner Katalin were very helpful and kind. You just could not find nicer people. This beautiful home is beachfront home is Paradise on one of the world's most beautiful beaches. The infinity pool and tropical Landscaping merge with the multiple blue hues of the crystal clear ocean. Home is fully appointed with luxury amenities. I'm a VRBO vacation home owner myself and highly recommend this home for vacationing families or individuals. The photos on the web site don't do this place justice. From the time you walk thru the front doors it feels like you have arrived in paradise. From the infinity pool to the breathtaking beach view this place is just amazing. You can do some of the best snorkeling right outside the front door. Romeo that takes care of the place is amazing and will do just about anything you ask from running to the grocery store to making you a nice big glass of rum punch when you arrive. They have a 2 grills outside for you to cook on and anything you can think of in the kitchen to make your own meals. Highly recommend you book this place, you will not be disappointed with this slice of heaven. If you are looking for an amazingly relaxing, beautiful get away I would highly recommend staying at Villa Oasis. Grace Bay was recently named the number one beach in the world. And I now know why. The house is huge and can sleep a good size group of people to split the bill. The location is stellar... Steps away from the beach and coral reef. We were able to experience some pretty awesome snorkeling (turtles, lobster, barracuda, and many other fish) Unreal views of the sun setting every night. Oh, and the infinity pool overlooking the ocean isn't too shabby either 👌😍👙🌴🍹I can't wait to go back!! !